Windrush Zindel’s Velvet Princess has an ARI with some of the most revered genetics in the industry including Dom Lucilio and Royal Fawn. She is a proven dam with beautiful offspring on the ground. You just have to look at her handsome 2011 son Galileo to see the quality she passes on to her babies. She has no milk issues, and no reproductive issues. Velvet is a good sized dam with plenty of capacity to carry big healthy babies. She is in the prime of life and will be putting cria on the ground for many years. Her fiber is still extremely soft with a beautiful hand to it. 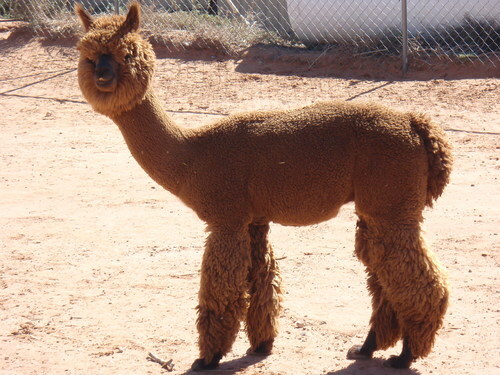 Her sire is our multi-color champion stud Zindel, who has won for both fleece and halter. Velvet is being sold with a breeding to any of our studs, and her price includes 90 days of free agistment while she is being bred. 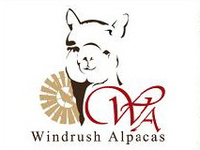 All Windrush alpacas are BVD/PCR negative, up to date on vaccinations, healthy, and socially well adjusted. Talk about impressive coverage, we think our Captain Sebastian (known to us as PJ) is a prime example! This boy has plenty of style too. Nice straight top line, well balanced, compact and great density of bone – and we haven’t even started talking about his fleece yet. I literally have a list of local fiber artists who have asked for first dibs on PJ’s fleece once I have finished showing it. 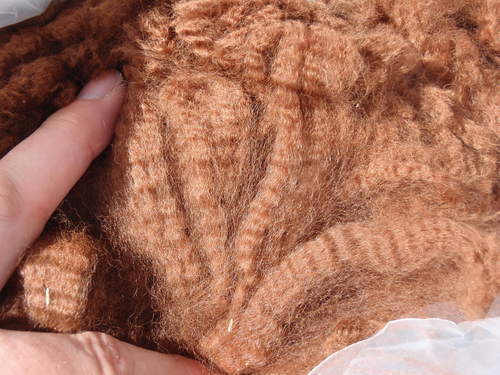 PJ’s fleece is fine, dense and has beautifully organized crimp, throw in brightness on top of that and what more could you ask for? PJ sheared 2.9lbs of fine fleece at his first shearing in May 2011. 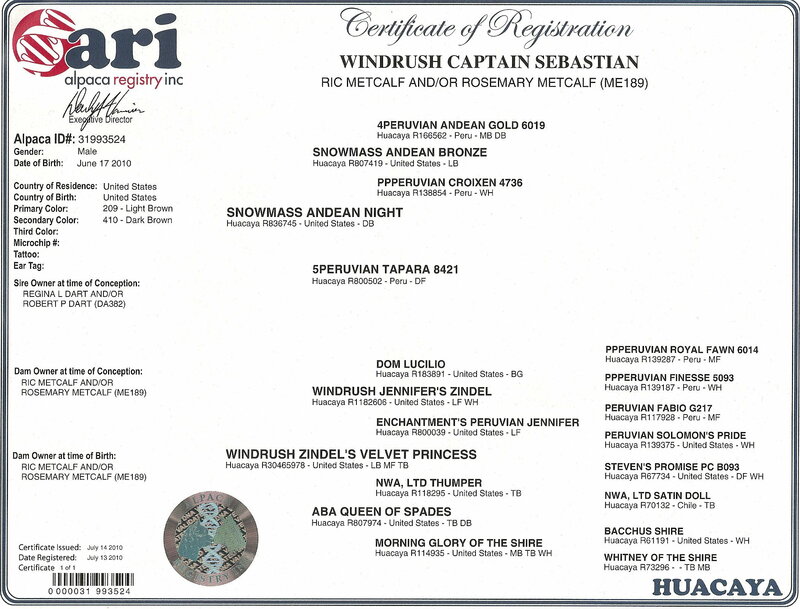 Oh and I guess we should tell you that PJ is the son of Snowmass Andean Night, an elite male from the renowned Snowmass breeding program who has multiple banner winning offspring on the ground. Let’s not forget PJ’s dam Windrush Velvet Princess who also brings solid genetics to PJ. Velvet is the daughter of our multi champion herdsire Windrush Jennifer’s Zindel and our favorite black foundation dam Queen of Spades. 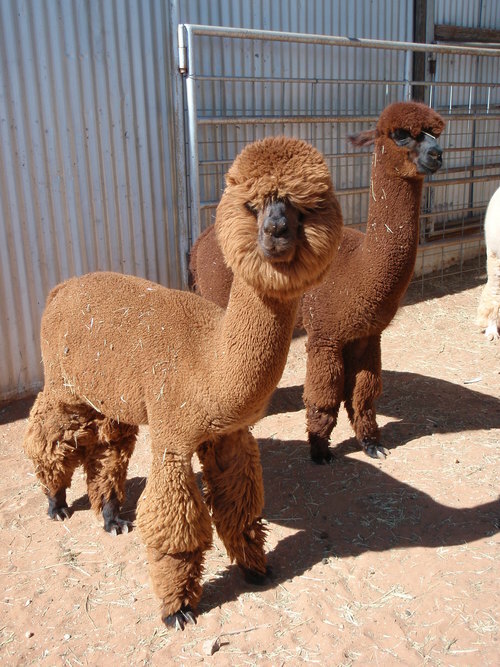 Both Zindel and Queen throw black offspring so if you are looking to add some elite fleeced black alpacas to your program PJ may be the Junior Herdsire for you.